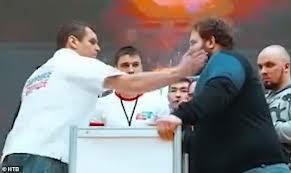 Russia has hosted a 'man slapping' championship in Siberia which saw one competitor knocked out with a single strike. The bizarre contest, held in Krasnoyarsk last weekend, saw men line up on opposite sides of a podium and take turns to slap each other in the face. According to Russian media the contestants were not allowed to block their opponent's strikes or duck out of the way. Footage shared by Russian broadcaster NTV showed a contest between a large bearded man and a smaller contestant with dark hair.